Join the adventure this summer as documentary filmmaker and OPEN CINEMA founder & director Mandy Leith makes a pilgrimage across Canada to explore our country’s documentary legacy – past, present and future. Canada has played a leading role in the birth and development of the documentary art form. Today, it’s at a treacherous crossroads. It’s time to meet with documentary lovers and supporters to explore the new territory together, to take the pulse of the industry and put the players on the map. Traveling from Mile 0 BC to Mile 0 Newfoundland, Mandy will engage community, explore our vast country’s documentary legacy and share OPEN CINEMA’s innovative hybrid event model. The goal? 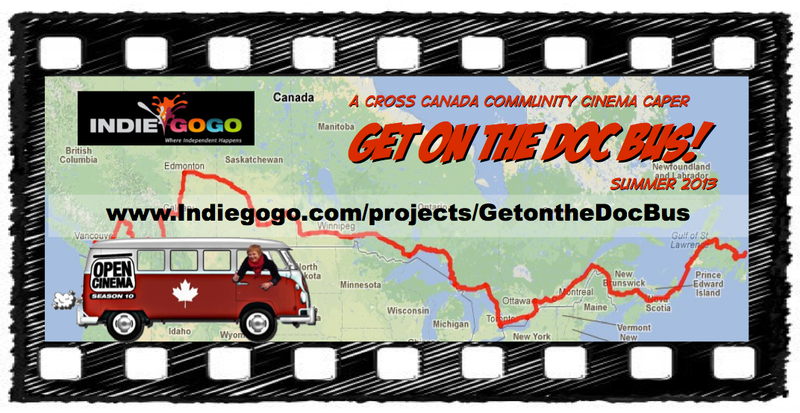 To seed a Cross Canada Community Cinema Network that will connect existing documentary screening programs and community partners from coast to coast to coast. While many great documentary screening initiatives already exist, there is no shared learning network, no best practices, no online hub to make the whole greater than the sum of its parts. We want to help fix that. We’re developing a website that will serve as a database of community screening partners. We’re using a WordPress theme that uses Google Maps API to create a map-based directory. You’ll be able to register your organization, choosing from a dozen categories that specify your affiliation with community screenings. Whether you’re an arts org, screening venue, film producer, distributor, non-profit org, food provider, we want to hear from you! Your organization will then appear as a pin on the map, with links, photos and posts associated to it. This will serve to form the beginnings of a grassroots network. We want your input on everything from the name, to how it can serve the documentary community! For now we’re calling it a Cross Canada Community Screening Network. Tell us your thoughts! If we all work together, we can make this happen and support our struggling documentary industry. We want to build community, so that’s why we need you! You can contribute in a variety of ways. We want to CONNECT with film lovers, filmmakers and community screening organizers like YOU as we travel across the country. We’ll discuss what’s working, what issues you’re facing and talk about possible solutions using live and virtual technologies. Please contact us to arrange a meeting when the Doc Bus is in your area June – September 2013. We’ll do our best to meet you, based on scheduling and geography. We need FUNDING to help us make this mapping project happen! We’ll make a pilgrimage across the birthplace of the documentary, so we need money for gas, food, basic living expenses, campsites, a roadie/cinematographer honorarium, website development, social media support, insurance. You can contribute $10, $100 or $1000 or more. Details of our budget breakdown below. Here’s a detailed breakdown of our budget for the project. The biggest expense is food and living expenses for Mandy and the digital roadies/cinematographers who will join her at different points along the way. $12,000 covers $100/day for food and basic expenses for two of us for 4 months on the road. And I figure we’ll spend about $3000 on gas. A project like this needs to be filmed as much as possible, so we want to pay someone (or a few someone’s) an honorarium to get on the bus as a digital roadie. If we don’t make the full amount during this campaign, Mandy is going anyway, but it might mean she’ll travel alone, or shorten the journey as needed. Your contribution, however small, will help make sure Mandy can go all the way to St John’s Newfoundland, where there are some dedicated documentary fans and committed groups we’d like to meet. WE HAVE PERKS FOR YOU IN RETURN! 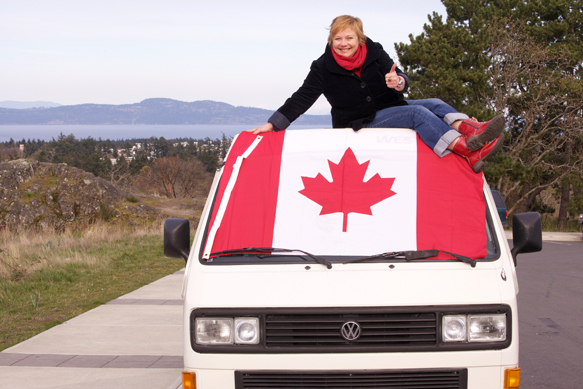 In return for your contribution, we have a bus load of great perks to offer you, including online and offline promotion, custom photos of your favourite spot in Canada and beautiful Get on the Doc Bus 2014 calendars. For bigger donors, we’ll give your logo nationwide exposure by adding it to the bus! Documentary is one of the few genres of investigative journalism we have left. They keep us informed, tell our stories and serve as calls to action. Let’s find ways to keep the documentary industry alive and well. Developing a grassroots network of community documentary screening programs is one step in the right direction. Documentaries are hot, people are hungry for in-depth stories about real people dealing with real issues, locally and globally. Judging by the growing popularity of documentaries at festivals, in cinemas and at award ceremonies, the average filmgoer believes the genre is on the rise. But behind the screen, the changing economic and digital landscape is throwing the documentary industry into crisis. Broadcast documentary strands are dwindling, production companies are closing their doors or retooling and the traditional models of production and distribution are breaking down. This leaves the industry with a lot of unanswered questions about how best to fund, produce and distribute documentaries, utilizing their potential to inform, entertain, and engage in an always-on digital universe. We hope you will join our cinematic pilgrimage as we explore and document the grassroots organizations that are doing their best to weather the storm. Mandy’s goal is to share her passion and experience running ‘one of Victoria’s most successful cultural enterprises.’ (Micheal D. Reid, Times Colonist). We can’t do this without you, so if you love documentary, please contribute to this exciting movement building opportunity. If you can contribute financially, every $10 helps. Thank you! A like or a share is also a great way to support documentary. Please, tell your friends, family, co-workers and film lovers. Documentary needs you! Today, with support from the Cities of Vancouver and Burnaby, Tsleil-Waututh Nation are hosting a conference designed to stimulate discussion, explore clean energy alternatives, and raise public awareness about the expansion of the Canadian tar sands and oil industry transportation infrastructure. As a community at the terminus of the Kinder Morgan pipeline and with all of the controversy surrounding the Kinder Morgan pipeline expansion, Tsleil-Waututh felt it was time to organize a large scale “meeting of the minds” to allow for intelligent, respectful and informed debate on the economic and renewable energy alternatives to oil sands expansion in BC. The Summit includes compelling speakers and discussion, and a special evening of Indigenous blues music and cultural sharing. Please consider watching online today and learning about these important issues. Today’s events willalso be broadcast in a couple of weeks on W2TV (courtesy of ACCESS and Shaw Cable 4) throughout the Lower Mainland and Fraser Valley. Let’s build on the momentum and bring people together from various walks of life and sectors to voice our united voice! About 75 Downtown Eastside residents and supporters gathered at the former police station at Main and Cordova today to claim the empty building for social housing and a community space for Aboriginal women and social justice groups. “No corps here. 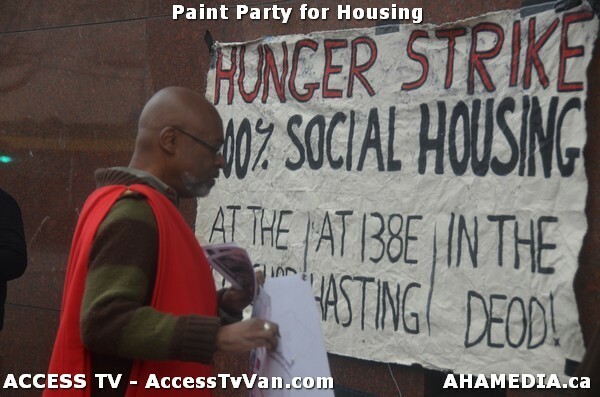 100% social housing,” said one sign. “People not profit,” said another. Every resident based group in the Downtown Eastside supports this demand, including the Vancouver Area Network of Drug Users, Downtown Eastside Neighbourhood Council, Carnegie Community Centre Association, Downtown Eastside Power of Women Group, Aboriginal Front Door, Gallery Gachet and Western Aboriginal Harm Reduction. The action was one of a series by Formerly Homeless Dave and his supporters. Dave is on day 24 of a Hunger Strike. 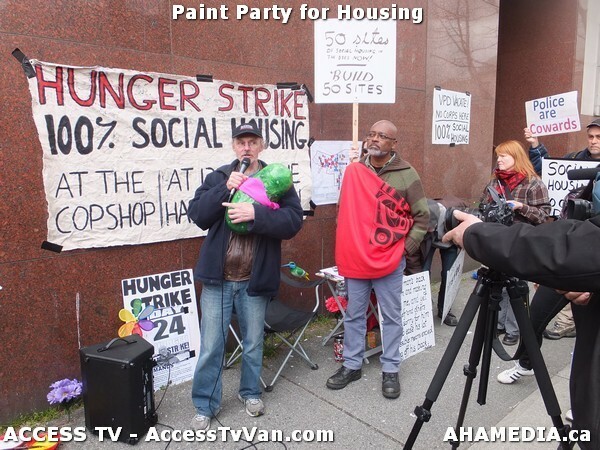 His demands include using the city owned former police station for social housing, having the city buy the site at 138 E. Hastings for social housing, and declaring the Downtown Eastside a Social Justice Zone where low income people won’t be pushed out. Ten year old Agnes, started painting the wall with a three foot high daisy, part of a DTES tradition begun in 1995 when now MLA Jenny Kwan painted a daisy on Woodward’s as part of a fight to get it turned into social housing. But the 125 units of singles social housing at Woodward came with 536 condos which pushed up land values and prices nearby, and over 400 SROs raised rents, within a block of Woodward’s, beyond what people on welfare and pensions can afford. “We won’t be tricked again,” said Dave Hamm of the Vancouver Area Network of Drug Users. DJ Joe of the DNC board said she was also in support of the Hunger Strike. Formerly Homeless Dave plans to continue the Hunger Strike until action is taken on his demands. Mothership Stories Society is a non-profit society that asks people to write the story of their mother’ lives. From these stories we have created theatre, books and an online Archive. (http://www.mymotherstory.org) We want to share and celebrate the extraordinary lives of ordinary women with the world. My Mother’s Story, the theatrical version of our project was created by Marilyn Norry (actor, dramaturg and Mothership Artistic Director) and Jenn Griffin (award winning playwright and actor). Under commission from a professional theatre we custom make a script from lifestories written by women in a community about their mothers. Help us share the extraordinary lives of ordinary women by getting us to the Magnetic North Festival in Ottawa! Please donate to Mothership Stories Society: My Mother’s Story Indiegogo campaign to go to Magnetic North Festival in Ottawa!! Rick makes Homemade Sauce and tries to figure out how much he made and what the calories, protein, salt, and fat content is.